ABC challenge: Color Club Kismet | Light Your Nails! I love every single one of the Halo Hues, and as a green polish lover Kismet gives me life! I admit I wished for a more unique colour, but that strong holo just speaks for itself! Stunning colour - just perfect for a dday out in the Sun! The holo's of this brand are so strong! Love! They are incredible, I love them all! This is stunning and the whole collection is amazing! I agree Helena, they are all gorgeous! The CC Halo Hues probably will always be my favorite holos. They were my first and they are still one of the absolute best holos I've ever put on my fingers! I am pretty sure they weren't my first but they are indeed among the best ones! Beautiful pictures! I love the halo hues, I want to buy a few more when I can fit them into my polish buying rotation. Thank you Chelsea! I'd love a few more from the newest batch, too! I love the CC Halo Hues - I think there would be a riot if they were ever discontinued! I know that Kismet is not the most popular of them, but I still enjoy it very much. This is a perfect time of year to be wearing it. It looks lovely on you. Thank you Lara! I hope they add even more hues! That's about what I do haha! Sssseh vabbé, poi arriva lei e ci ammazza con 'st'holo da urlo! Il prezzo Cosmoprof l'anno scorso era abbordabile... peccato che quando siamo passate noi ancora non lo avessero deciso! 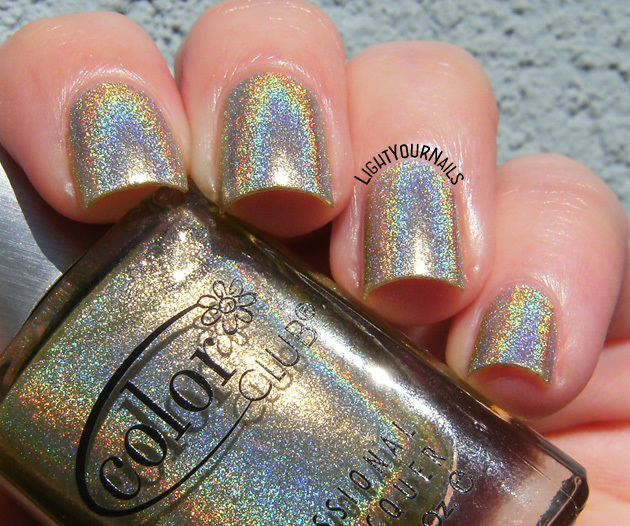 This is so gorgeous-- I love how strong the holo is! I definitely see a strong gold tone in this, as well as the green! I think it's less noticeable in person?! This was one of my first Color Club holos and it does not disappoint at all. The holo is so strong in this polish! Looks great on you! I tend to think every single shade is worth having! Wow that holo is just amazing. Qualsiasi sia il colore di base, alla potenza della fiamma olografica degli Halo Hues non riesco proprio a resistere. I have all the Halo Hues and it's hard to pick a fav, but this one is super pretty. Sorry but as stated I don't post comments containing links! Can you believe I only own one of these? 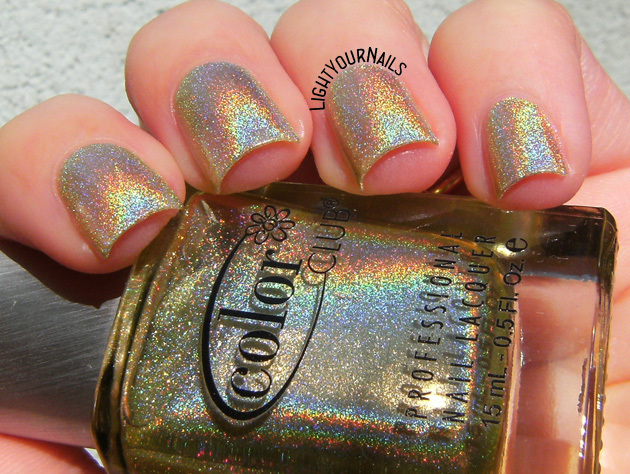 Such a beautiful holo! I've never used mine for stamping yet! Gotta fix that soon! Oh my, that is absolutely stunning!! devo mettere gli occhiali da sole x guardarlo! That flame.. I neeeeeeeeeeed this! I know! The CC Halo Hues are all must haves!